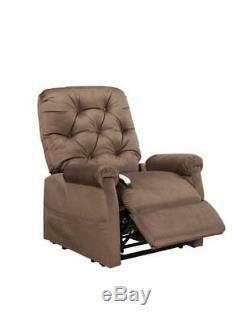 Regain your independence, get in and out of chairs safely & easily, even sleep in your chair with.. Easy Comfort Lift chair in chocolate. 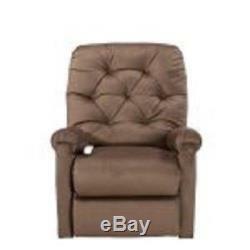 NM-200 3-position Reclining Lift Chair. The factory re-named this chair; it was previously called the LC-200. 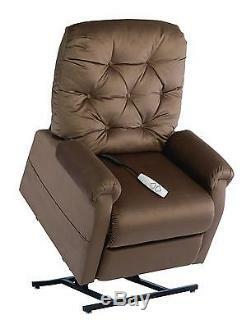 Experience the relaxing enjoyment of owning a beautiful NM-200 reclining lift chair. 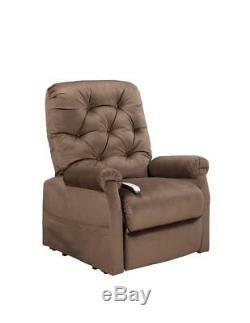 NM-200 lift chairs are easy to operate and feature very quiet and smooth lift and recline. NM-200 chairs provide superb comfort, style and dependable performance. Whenever you want to watch television, sleep, read or simply sit back and relax, you'll love being able to ease into your Easy Comfort. When you're ready to get up, it will lift you up with the push of a button... The NM-200 is available in several colors; see other listings for alternate colors. One (or more) will surely look great in any room in your home. As many lift-chair users spend virtually all day and night in their chair, these are built to last. Even if you don't use it that extensively, you'll appreciate the durability that's built in! Three-position, all electric lift and recline. USB hand wand gives you the ability to charge electric devices as you relax. Convenient pocket on both sides of the chair to store magazines, newspaper, remote control, more. Designed to bring you superior comfort and support. Suggested User Height: 5- 54. Seat to Floor Height: 20. Top of Back to Seat: 24. Top of Back to Floor: 42.5. Total Recline Depth: 61.5. Seat and back cushions are zippered for convenient filling, adjustment and replacement. CNC computer controlled fabric, foam and frame cutting for consistency in assembly and enhanced aesthetics. Extra-long sinuous spring suspension system used in seats and backs for deep, cradling comfort and improved weight distribution. High-quality fabrics tested for abrasion resistance, tensile strength, seam integrity and color fastness. Ergonomic hand control with large keypads for added reliability and ease of operation. The hand control is routed between the seat and back. You can choose for right or let-side placement. CNC computer frame cutting allows interlocking. Frame attachment to ensure consistent and accurate assembly with increased strength and durability. Furniture grade hardwood/plywood used in all stress areas for strength and durability. Counter-balance recliner mechanism features Permalife rivet joints with a Delrin bushing and Celcon washers for smooth, quiet and easy operation. Incorporates high-performance comfort material in seats and arms for unsurpassed durability under constant use. Our foam is profile cut to enhance comfort and eye appeal. Layered foam technology in all seats promotes dynamic rebound while maintaining a resilient, lively surface feel. Premium conjugate fiber for greater resiliency and elasticity to maintain comfort and prevent wear. New robotically welded, 12.5 gauge tubular steel lift frame for added strength and stability. Enhanced 6.5 gauge lift linkage with nickel steel bearings for increased durability and smooth operation. Four durable, easy adjustable steel leg levelers provide stability on uneven surfaces and seat-to-floor height modification. Lifting frame and mechanism are attached with 8 self-locking machine bolts and self-locking T-nuts to help ensure a stronger, more permanent and secure attachment. 29-volt, fully electronic power supply transformer features thermal overload protection with a safety shutoff, emergency battery backup in the event of a power failure and a green LED power connection light. New smooth and quiet motor for improved performance. Test "push" force rated at 6000N/1320 lbs. The motor features aluminum stroke tube with a cast aluminum fork head for increased torsion strength and durability. 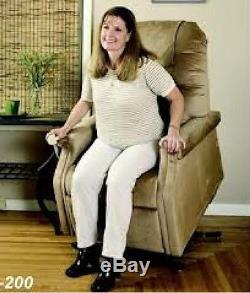 Start enjoying all the life enhancing benefits of an Easy Comfort Lift Chair as soon as possible. These sellers are easy to spot in variety of ways. One, the number of items on which they've given feedback is very close to the number on which they've received feedback. Three, these sellers generally have 100% feedback. While sellers strive for 100% feedback, let's be realistic. I don't need any more time to know what feedback to leave. I expect that my buyers will give me honest feedback (hopefully positive) either after they've received their item or after they've had a chance to use it. Badly damaged packages should be refused and the store should be advised. Furniture will be carried at most one set of inside stairs. You will need to supply the serial number from the chair for service. I cannot recall the last time I called a clientother than one who specifically requested a call. To make you so happy with your experience with WhyPayMoreShoppe that you tell all your friends, relatives, neighbors & co-workers. You will find extended warranties offered with listed items. WhyPayMoreShoppe has nothing to do with these extended warranties. WhyPayMoreShoppe cannot answer any specific questions on the extended warranties. However, WhyPayMoreShoppe supports the many consumer protection agencies who advise that extended warranties are usually not a good value. I stock almost nothing at my location. There are other sellers (both on-line and bricks-and-mortar) who sell from these factory inventories and real-time inventory status is usually not available to me. While I try to check factory inventories on a continuing basis, there will be instances when Im not aware of a temporary factory outage. For that, I apologize in advance. When I do know that an item is temporarily back-ordered, the listing will indicate that clearly. Any such indication will be prominently positioned near the top of the listing and will be easily distinguished from other copy by a distinctive change in font (color, size, and/or typeface). Windermere Motion warrants that the steel lift mechanism on your lift chair will be free from defects under normal use and service for as long as the chair is in use by the original owner. NOTE: Windermere Motion reserves the right to replace only the part of the steel lift mechanism that may be defective. (AS1001, AS1050, AS2001, AS3001, AS4001, AS5001, AS6001, AS7001, AS9001, FC101, NM101, NM1250, NM1450, NM1550, NM1650, NM1750, NM1850, NM1950, NM2001, NM2050, NM2450, NM2550, NM2650, NM3001, NM5001, NM7001, NM9002). Please contact your authorized provider for information on service visits. Service is not extended to fabric, buttons, or wear and tear items or issues. Labor does not cover product maintenance and/or adjustments. Only manufacturing defects are covered. Circumstances beyond the control of Windermere Motion. Repairs and/or modifications made to any part without specfic consent from Windermere Motion. Exclusions also include components with damage caused by. Abuse, misuse, accident, or negligence. Battery fluid spillage or leakage. Commercial use, or use other than normal. Improper operation, maintenance, or storage. WhyPayMoreShoppe is an authorized dealer for all items that it sells. Inspect the outside of all packages upon arrival. Check all 6 sides of the boxes. Shake boxes and listen for broken glass. If you choose to do open it in the drivers presence, make sure that you check completely and carefully. You are better protected if you indicate that the box is damaged than if you open the box and possibly miss something. Notify me within 24 hours of receipt if possible, 48 hours at the worst. In the event of damage, send me pictures of the damage and of the packing materials. Keep all packing materials until everything is resolved including disposition of damage items. You may not have an opportunity to check the package. The above steps are most important in this case. Hidden damage really cant occur here. However, clear pictures will still be needed. The item "Easy Comfort NM-200 Otto power lift chair, 3-position chaise recliner. Chocolate" is in sale since Friday, January 20, 2017. This item is in the category "Home & Garden\Furniture\Chairs". The seller is "whypaymoreshoppe" and is located in multiple locations. This item can be shipped to United States.